Bernard Meadows studied painting at Norwich School of Art. A friend introduced him to Henry Moore for whom he worked as an assistant for several years. Meadows’ first one-man show was at Gimpel Fils in 1957. He had initially attracted international attention at the 1952 Venice Biennale where a group of young British sculptors exhibited together in the British Pavilion, among them Armitage, Butler, Chadwick and Paolozzi. 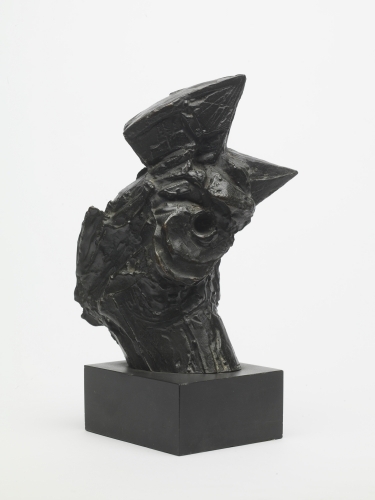 Through his series of sculptures exploring the forms of crabs and later birds, he found his own distinctive style and a way of escaping the influence of Moore. Meadows was not so much interested in animals but used them to portray and represent the human figure. He saw them as both distillations of the creatures’ own essential characteristics and as ‘vehicles, expressing my feelings about human beings’. He saw them as a means of addressing a particular aspect of the human condition, especially in the expression of extreme emotions or experiences. In 1960 Meadows became Professor of Sculpture at the Royal College of Art and it was also at about this time that the direction of his work changed, becoming more aggressive as seen in the series of armed busts, and more sensuous through the smooth forms of the pointing figures.